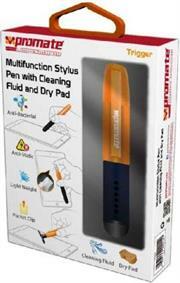 The Promate Overt.iPm is a multinational cleaning stylus pen and screen protector kit for iPad mini. Its stylus which offers precision touch with a smooth surface glide is specially built with many functions. With anti-bacterial and anti static cleaning solution to spray on the tablet screen surface and an expandable dry pad to wipe off dirt and fingerprints and smudges; all inside the pen-style stylus body compartment. A clear screen protector is also bundled with it for a long term protection of your tablet's screen. 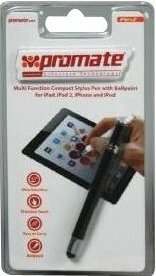 The Promate Lami is a multi-purpose stylus and ballpoint pen with replaceable stylus tip for all touch screen devices that clips neatly on your top pocket. Use the Lami to edit documents or simply to navigate your touch screen online. The sensitive tip works on all capacitive touch screen devices, giving fantastic control and accuracy every time you want to work or play. The Promate iPen.2 allows you to enjoy writing like never before with this Multi Function Compact Stylus Pen with Ballpoint for iPad, iPad 2, iPhone and iPod, Compact stylus pen with sensitive capacitive tip for smooth and precise performance.Refillable mini ballpoint pen and Works with any capacitive touch screen device Browse web and scrutinize documents with ease as this stylus features capacitive tip for pinpoint accuracy. Also the outer casing is comprised of metal which enhances durability.When not in use you can easily stow away the iPen.2 in your shirt, briefcase or laptop bag.